A is thrice as good a workman as B. He is able to finish a piece of work in 60 days less than B. Find the time in which they can do it working together. Twenty men can finish a piece of work in 30 days .after how many days should 5 men leave, so that the work may be finished in 35 days? Father is two times faster than his son. If father and son can complete a job in 12 days how long will it take for the son alone to complete the same job ? 3 men can do a piece of work in 6 days. After 2 days 3 more men joined them. How many days will they take to complete the remaining work ? How many days will 12 women take to do a piece of work which 10 men take 15 days to complete, if 3 women do as much work as 2 men? If 12 men and 16 boys can do a piece of work in 5 days and 13 men and 24 boys can do it in 4 days, how long will 7 men and 10 boys take do it ? 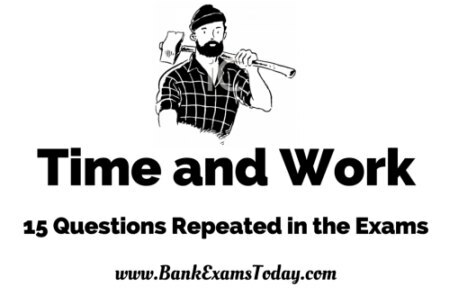 A and B can do a job in 15 days and 10 days respectively .They begin the work together but A leaves after some days and B finishes the remaining work in 5 days . After how many days does A leaves? 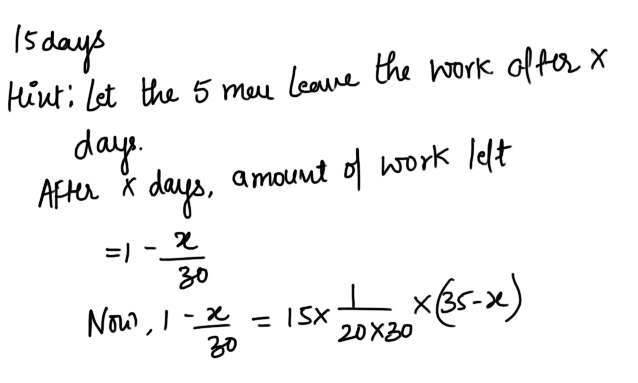 A can do a piece of work in 15 days .If he is joined by B who is 50% more efficient, in what time will A and B finish the work? X does 1/4th of a job in 6 days. Y completes rest of the job in 12 days. 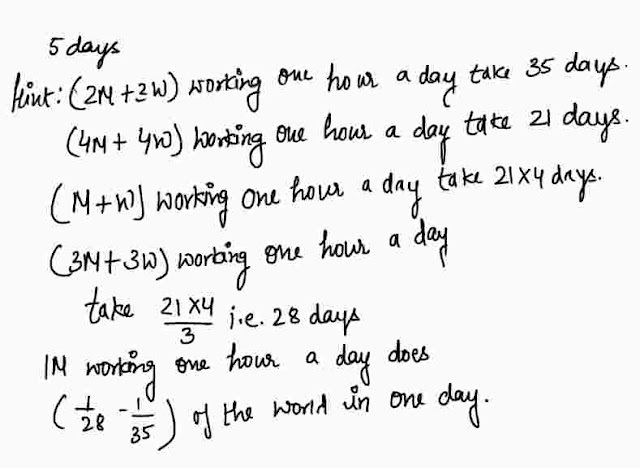 In how many days could X and Y together have Complete the job ? If 3 workers collect 48 kg of cotton in 4 days, How many kilograms of cotton will 9 workers collect in 2 days? A can copy 80 pages in 20 hours. A and B together can copy 135 pages in 27 hours .In What time can B copy 30 pages?